Every one love to become famous between people and want to popular on social media like on face book. Getting fame on any social media is not easy until you fully understand it and also know its trick so that you can do something extra which other can’t do. When someone create Facebook account then to increase number of friends they add friends or they find new friends to grow their account in order to increase friend list. To increase your number of friends onto your account instantly you have to send multiply friends request to maximum people. Facebook will suggest you people may you know people on the side bar or to your news feed so that you mutual friends or friends of friends can also meet with you. It is very easy to get five thousand friends with in 24 hour but that is little bit risky may be your account become disable due to reason of spamming or you adding friends too fast. If you are sending 100 friends request per minute then you be block by adding more people onto your account. Facebook limit the user they can sent 100 or more request. If other user are not accepting your request the number of sent request will be increased by that limit. And you will be block from that. To regain this feature you have to cancel all sent request from your ID. Otherwise you can’t add more people. 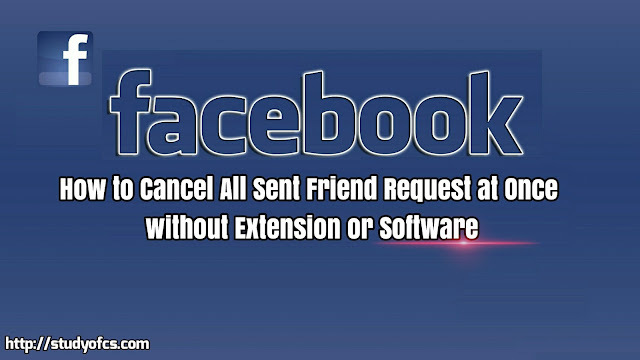 To cancel friend request there is not an option from which you can cancel all request with only one click. Click on the Facebook page. And hit on find friend button. And then click on view Sent requests. 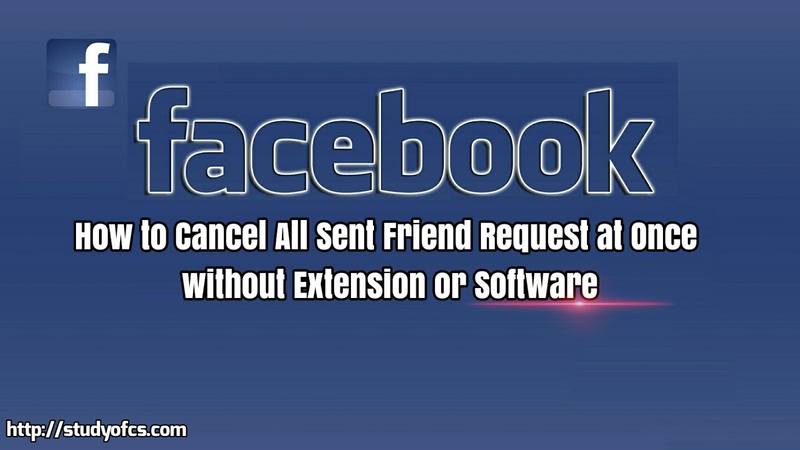 Hoover the mouse on friend Request Sent button and then at the end of the menu box click on cancel request. If you sent more than 200 request then you need to repeat this again and again which is too much time consuming. Of course this is too much difficult. 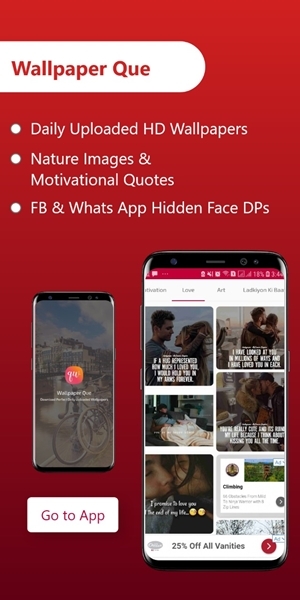 But here in this post you will learn a quick and easy way to remove all sent request without any extension or without any software or script. 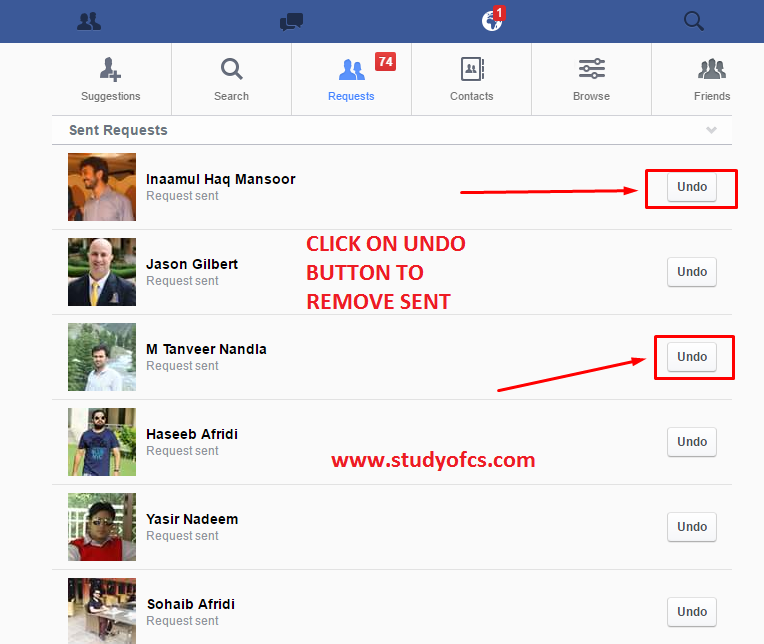 If you sent request to people you don’t know and accident click on add friend button then you are at right place to get rid of this problem. Login to your Facebook account on a browser. Follow this image click on it. 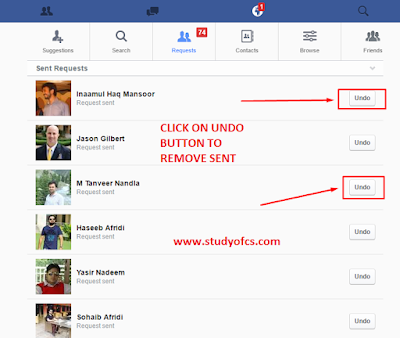 You will see a page written friend name whom you sent request and undo button. To remove or delete that friend simple one click on undo button and you are done.